We want to let you know about a special program we’re running throughout October to benefit SafePlace and in support of Domestic Violence Awareness Month. We’ve planned this for a while, but the events at a national level these past couple weeks regarding sexual violence really couldn’t provide a more perfect context for at least one reason why we’re working with SafePlace. Here’s the quick and simple version: In October, we’re donating 15% of all proceeds from gift certificates purchased under this program to SafePlace, including floats, massage, craniosacral therapy, and/or intuitive counseling with energy work. AND … when you buy four, you’ll get one FREE. Amazing deal for you proactive Christmas shoppers, while also doing good in the ‘hood. To receive a free session (float, massage, or any other service we offer) when you buy four, give us a call at 360-972-3031. Served 1,417 survivors of domestic and sexual violence. Answered 7,856 calls to their 24-hour Helpline. Provided 13,584 hours of advocacy. Provided safe confidential shelter and housing services to 274 individuals. Provided 8,462 shelter bednights and 25,386 meals. Supported 104 adults in community support groups. Taught 4,455 local youth about healthy relationships skills and breaking the cycle of violence. Responded to 316 sexual assaults, of which 58 were children or youth. SafePlace and The Soul Space feel like a natural alignment. Our entire center is cultivated to provide a sense of safety, solitude from the stresses and craziness of the outside world, and a grounded place to heal, transform and grow. Our float tanks provide a destimulating, non-triggering environment for deep relaxation, reflection, and regeneration; our massage therapists provide nurturing, trauma-sensitive physical touch that can help bring the mind and body back into unity; and our energy workers provide intuitive counseling that helps all aspects of our clients’ being release the accumulated tension around past traumas and old patterns, and create space to form new perspective, thought processes and associations. We share SafePlace’s vision of a world without sexual violence, domestic violence, or any form of violence, whether directed at others or at ourselves. If that’s sounds like a world that you want to support too, pick up a gift certificate for any of our services and you’ll be directly contributing to an actively engaged and long-proven organization that’s helping making it happen. You can buy gift certificates for yourself to use later on, for your friends and family, for your employees or co-workers, perhaps for your child’s teacher as a thank you for all the great work they do too, or for anyone you think needs a break and an opportunity to slow down, destress and return feeling refreshed and refocused. If you have any questions, please feel free to give us a call at 360-972-3031. SafePlace’s 24 Hour Helpline number is 360-754-6300. You can learn more about SafePlace at https://www.safeplaceolympia.org. 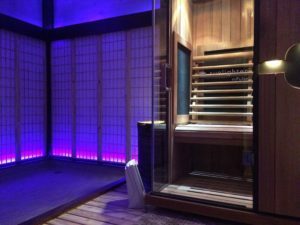 Also, as we transition towards winter and the sunlight starts to wane, just a reminder about our our PNW Winter Survival Tool: our Infrared Sauna with Full Spectrum Light. Full spectrum heat, full spectrum light, no S.A.D. Come get toasty and healthy with us. We appreciate you! Have an awesome October.